Feeling too busy? Hit a creative block? Looking for fresh ideas on a project that's become stale? Re-energise your creativity with Creative Mindfulness. One of the biggest myth about creativity is that you need to be in the “mood”. The right frame of mind is not what is going to make you creative. The most important thing about having a creative life is not the mastery of a skill, or a thorough knowledge of whatever it is you want to create. The single most important factor for a creative life is scheduling time. Regular time. 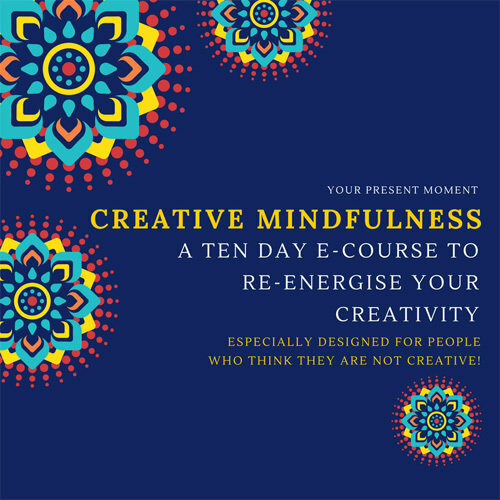 Created by Meg Welchman – psychologist and author of 'This Present Moment - An Art Therapy Journal' – Creative Mindfulness provides fun, insightful, easy lessons, grounded in positive psychological theory, that explore what it means to be creative and how to bring more creativity into your life. • plan your time for maximum creativity… and more! Join us for 10 days of fresh thinking and simple activities to stimulate the creative muscle. You can join anytime and work at your own pace!